Spring Gate Farm Fall Workshop …. … an absolutely perfect day in the mountains … on a 227+ acre farm … with knitterly friends … teaching them the ins and outs and wherefores of knitting with cashmere. We were a small group — only four students — but LOTS of time for one-on-one and ensuring that all understood the intricacies of knitting lace: the YOs, ssk, k2tog, sl1k2togpsso, etc. We also talked about WHY you should always wind a center-pull skein (especially when using luxury or pure animal-fiber yarn), how (and WHY) reading charts (and your knitting) is so much better than following row-by-row directions, and how best to “dress” or “block” your finished knitting. This design could then be made into the students’ choice of accessory: a long, skinny infinity scarf; a close-to-the-neck cowl; or a 6×48 scarf. 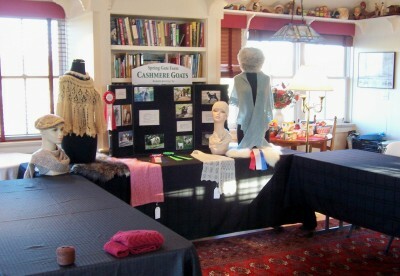 Any of these items could be made with the 1oz skein of cashmere which they received as part of the workshop cost. 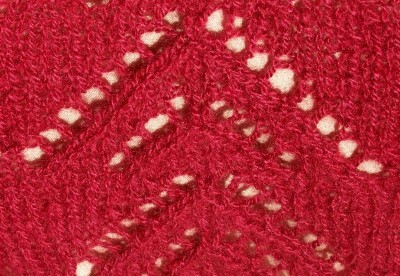 I will be posting the pattern (later this week) on my Craftsy site and in my Ravelry store. 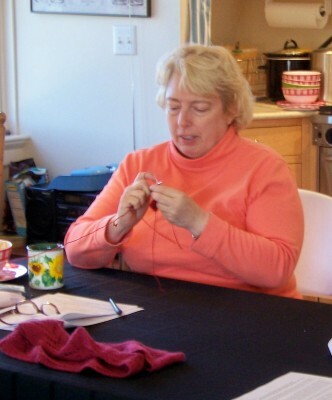 Definitely wonderful to be back in the “knitting classroom” and teaching others to be as fiber-fanatic as I am! BTW, this was the 5th workshop I’ve done down at Spring Gate, and our 4th year of doing them in the Fall. I think next year’s will have to be extra special for our “Fifth Annual”, don’t you? how nice! I was just thinking of you and thinking I had not seen a post in a while! 🙂 God bless!! !